The central left-right divide continues to define electoral choice in Britain. 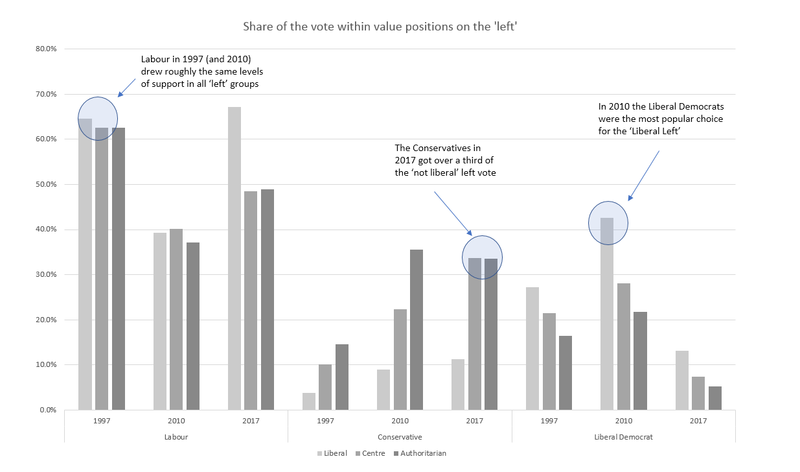 Whether measured as a position on a value scale defined by items around economic distribution or in terms of self-identification there are clear divides between Conservative and Labour voters that are almost as potent in 2017 as they were in 1992. But this divide is evolving, and this evolution is driven by the intersection of these economic values by other deep-seated value positions. These are best thought of as a second dimension of core values which relate to ‘social’ or ‘cultural’ issues. Following the labels attached to it by those who first measured it in the UK context I will call this the ‘Liberal-Authoritarian’ dimension. In each case people are asked to express how much the agree or disagree with the statement on a five-point scale. The items are added together to form a scale (running from one to five) with low values representing the ‘left’ of the scale and higher values the right. To ensure comparability over time a fixed portion of this scale is defined as ‘left-wing’ (those with scores of 1–2.6 on the scale). Between 1992 and 2017 around 55% of the British population were identified as ‘left’ using this measure. Again, the scale runs from one to five, with low values being liberal and high values authoritarian. This scale is divided into 3 parts, a ‘liberal’ part (values 1–2.6), a ‘centre’ part (values 2.61 to 3.40) and an ‘authoritarian’ part (3.14 to 5). We can then identify three fractions on the ‘left’ and compare their social locations as well as their political behaviour over time. 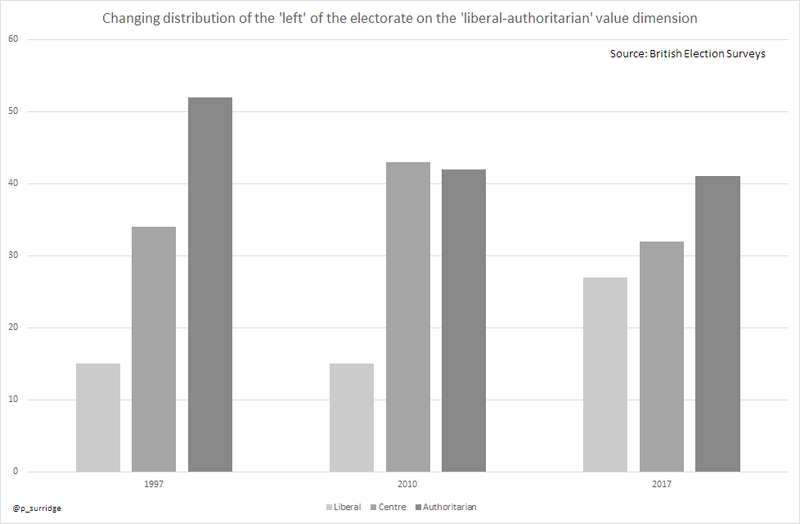 In 1997, around half of those positioned on the ‘left’ were also ‘authoritarian’, with 15% ‘liberal’ and whilst the largest group on the left in 2017 remain the ‘authoritarian’ left, the size of the liberal left has almost doubled over this period, reflecting changes in the social structure. The relationship between social position and value positions on the ‘liberal-authoritarian’ scale has changed little over the last two decades. The ‘liberal left’ is younger, better off and better educated than the centre or authoritarian left — but it has been throughout the last two decades. Most stark among these divides is that relating to education; in 2017 half of those on the liberal left had a degree level qualification or higher compared with just 1 in 10 of the authoritarian left. Unsurprisingly, they are also divided by EU Referendum vote (itself a reflection of these divides) but similarly this divide was also evident 20 years ago. Though this divide has widened over time. Whilst the authoritarian left were the most Eurosceptic in 1997, it was not quite a majority position among this group. By 2017, 7 in 10 of the authoritarian left said they had voted to leave the European Union. Whilst the relationship between social structure and value space has changed little over time there have been significant changes in the relationship between values and voting behaviour. But crucially these changes pre-date the EU Referendum. In 1997 Labour won the votes of roughly 3 out of 5 voters on the ‘left’ regardless of how liberal they were. The level of this dropped to 2 in 5 in 2010 but the pattern remained largely unchanged, with equal levels of support among all groups. However, in 2010 the left were not even in their support for Labour. The liberal-left voted heavily for the Liberal Democrats, who were the first-choice party among this group; winning over 40% of the vote share. In contrast, the Conservatives increased their share of the authoritarian left vote in 2010 (pre-dating the rise and collapse of UKIP and the EU referendum). In both 2010 and 2017 the Conservatives were able to attract the votes of around 1 in 3 of these authoritarian ‘left’ voters. The electorate on the left in the UK is fragmented by their social/cultural values. Since 2010, those on the left who are not also ‘liberal’ in their social values have become less likely to vote Labour, whilst the ‘liberal’ left have become more likely to do so (reflecting the collapse of the Liberal Democrat vote). But the ‘left’ are not predominantly ‘liberal’; there are far greater proportions of the electorate in ‘left-centre’ and ‘left-authoritarian’ positions. The interests of these groups may be difficult to reconcile; but for a party of the ‘left’ to be electorally successful a coalition of these disparate social and ideological groups will be necessary, similarly a party of the ‘right’ may well be able to appeal to significant segments of the ‘left’ vote by focusing on their non-economic concerns. Data are drawn from the British Election Surveys, face to face surveys designed to be representative of the adult British population. Researching values, identity and social class and their impact on political behaviour.